Three new coil-fed press lines allow a captive metalforming shop that once only supplied its furniture-making parent company to cultivate high-volume just-in-time contract-stamping opportunities. 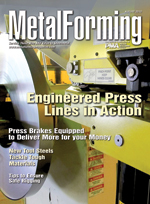 New technology developed by press-brake manufacturers helps fabricators overcome these and other sheetmetal-fabrication challenges: grain-direction variability, inconsistent material thickness and mechanical properties, and increased part complexity. Don't underestimate the dangers presented by the heavy loads lingering overhead in your shop, including massive dies and weighty steel coils. Be sure to properly size rigging equipment, and inspect often for early signs of wear and tear. ...developed to take on the demanding tasks of blanking, forming and trimming the latest-greatest HSLA and AHSS sheet steels.